WAIPAHU — For the second day in a row, Pearl City took an opponent to penalty kicks to advance in The Queen's Medical Center Division I Girls Soccer State Championships Friday at the Waipio Peninsula Soccer Complex Main Stadium. The Chargers edged the Cougars, 3-2, in PKs in a 2-1 semifinal win. Pearl City, the 2016 champion, will try to reclaim its title against defending champion Iolani, 7 p.m. Saturday. With the match knotted at 1 after regulation, neither team scored in two 10-minute sudden-death periods to force PKs for the Chargers, who ousted top-seed Kamehameha, 1-0, by winning PKs, 7-6, in Thursday's quarterfinals. "Semifinals, I think I've been in it 10 or 12 times and you have to leave it up to the kids," Pearl City coach Frank Baumholtz III said. "They were sluggish because of the long game last night — we have to work that out some time before we play (Iolani) — but you see how icy they were in the shootout. Somebody misses, that's OK. We'll get the next one. Exciting." The story was Chargers goalkeeper Naomi Takata. After recording 16 saves in 100 minutes of play, she made two in PKs the clinch the game. The Cougars went up first and Takata set the tone by making a diving stop to her left on Kaiser's Kayli Yoshioka's kick toward the low right corner. "That was awesome," Baumholtz said. "That set the tempo … Naomi has been all-world the last two days, just blocking everything." Kaiser coach Noelani Bio agreed that first save was crucial. "I think that gave us the shakes," she said. "It makes people nervous when the goalie makes the first save. You never expect the goalie to make a save, let alone the first save. She's a good goalie. That was definitely a game changer, that's for sure." "A lot of players look to one side and kick the other way, so I just went with what I thought was right: my instinct. But they (the Cougars) played really well," Takata said. "They had good PKs too." Pearl City's Piper Collado put her team up 1-0 with a goal past Kaiser keeper Madison Mora. Kaiser tied it in the second wave on a goal by Shaley Mercado, but that was short-lived as Hunter Malaki put the Chargers back up, 2-1. Kaiser's Kailie Halvorsen, the Division I leading scorer with 31 goals, hit her shot off the crossbar. Kaiser changed keepers from Mora to utility player Madison Corso, who could not stop Daelenn Tokunaga's shot to make it 3-1. Alyssa Gabriel made her goal to pull Kaiser to 3-2 after three rounds. Corso made a save on Reyann Lee's try to keep the margin at 1. But Takata made her second save of the PKs on Taylin Park's kick to end the game. The Cougars took a 1-0 lead in regulation on a goal from 10 yards by Halvorsen. 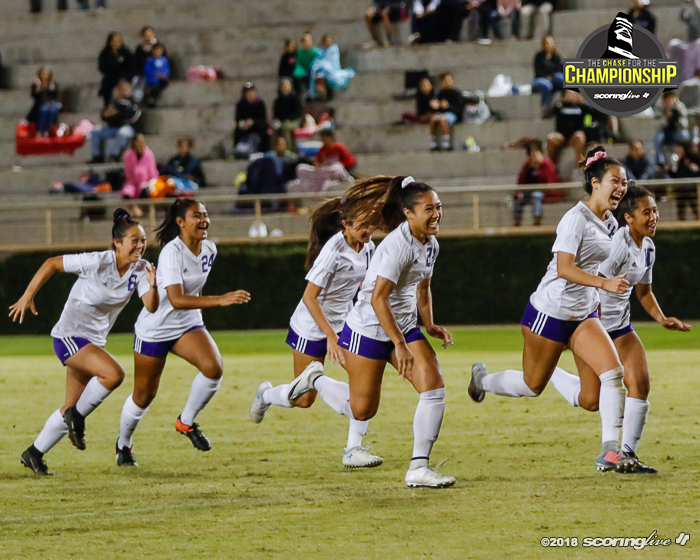 She had a chance to give her team a commanding lead before the half, when Pearl City was called for a foul in the penalty area, But Halvorsen's PK sailed over the net. "When you're up there 12 yards away, you never know how the ball's going to spin," Bio said of Halvorsen's missed PKs. "We've been practicing that for the past two, three weeks. It's never been that high. Nerves. It could be so many different factors." That might have pumped the Chargers for the second half. After taking just five shots on goal in the first half, they registered 13 in the second. Mora recorded five of her eight saves in the second half. Halvorsen also took two shots on goal just before the end of regulation, but they were wide and high, respectively. In the first OT, Halvorsen's direct kick from 35 yards was on target, but Takata punched the ball out that set up a corner kick by Mercado. The ball again made its way toward the goal, but Takata punched the ball up. Late in the second OT, Halvorsen made another nice shot toward the goal, but Takata made a one-hand punch for the save. The Chargers' endurance will be tested against the Raiders. "Iolani's like the Energizer Bunny," Baumholtz said. "You gotta pull the plug on the battery."